The picture above is of me starting to sort it all out, sometimes to clean things properly the process makes a bigger mess than if you just left it alone! You have to start pulling out all the stuff you rammed away with no thought or care, it takes forever and I always end up thinking….why didn’t I just sort it properly in the first place! 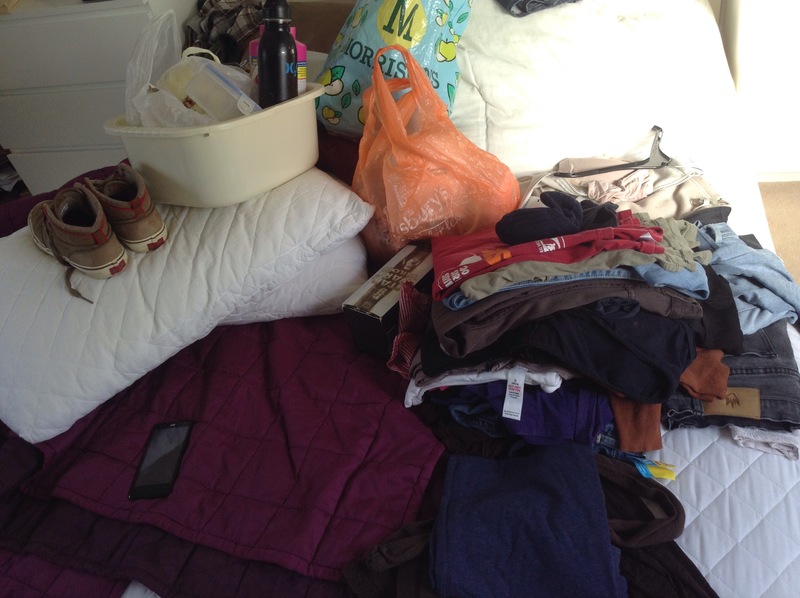 As I looked at the rubbish piled on my bed I felt the Holy Spirit whisper to me…you need to do this in the spiritual as well, have a good old sort out. Just like in the natural world we can put our needs last because everything/everyone else is clamouring for our attention….the only problem is when we are living in a mess in our internal world it has a negative impact on the people we love and our external world. A bit of self care isn’t selfish, if we are supposed love others as ourselves we will struggle if we don’t deal with our own issues. If your harsh to yourself…you will end up treating others that way, or thinking about them critically as a minimum, even if you keep it all looking good on the surface. We get away with it for a while by ramming them away out of sight but before long the mess starts spilling out through angry outbursts, snappy overreactions and feelings of insecurity, hurt or offence. The problem is once you start to deal with it all….it makes a bit of a mess and it’s not always pretty to look at your inside world in the cold light of day. But it essential if we want the freedom that Jesus wants us to have. If we want to walk in the fruits of the spirit, do all He is asking us to do and deal with all that life throws our way. The kind of mess in your room will look different to mine….but unless you are Jesus, I can guarantee you there will some mess in there! Depending on how deep you have buried it and for how long (to put on the appearance of tidiness, order and control) will affect how big a mess it is to sort out. Jesus what do I hide away so no one will see? Am I offended at or jealous of anyone? Why? When I speak to …… Why do I always feel like that? Have I been agreeing with critical thoughts about myself and listening to shame telling me I’m not worthy or deserving of good things? Previous Beauty for Ashes Next Service or Repair? Thank you Emma for your great blog. Think I need to do some dusting…..